2 Should I Format It NTFS Or Leave As FAT32? 16GB was enough for my needs and 32GB was getting really expensive. In fact, 16GB seems to be the best bang for your buck with the current offerings. The stock 2GB card on the Hero was Class 2 which only guarantees transfer speeds of 2MB/s (megabytes per second). The A-Data card is Class 6 which (did you guess it yet?) guarantees at least 6MB/s. I will be able to transfer my music and other files between my computer and back faster. More importantly, the phone itself will be able to read and write data faster, which means faster loading of photos, videos, music, and applications that use external storage. It also means faster writing of data, which is important while taking pictures and installing apps. 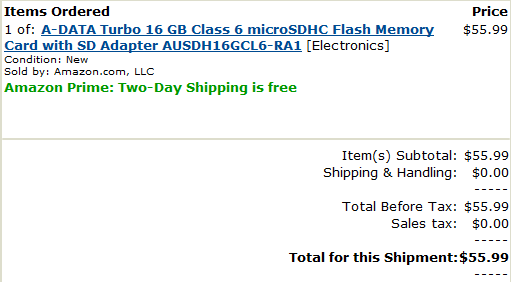 The price at the time of the purchase was $55.99 from Amazon which comes out to a decent $3.5 per GB. The A-Data card has 24 Amazon.com reviews averaging 4.5 stars. This is always a good sign. Also in the package: an SD sized adaptor so that you can connect your MicroSD card to any device that has an SD port, such as your computer or camera. Very nice as you might not always have your phone on hand. Should I Format It NTFS Or Leave As FAT32? The A-Data card came preformatted as FAT32 so I popped it right in and formatted as NTFS out of curiosity to see if my phone would read it and gauge any performance improvements. Well, understandably so, the Hero could not read it. It's Linux based after all, so I didn't really expect it to. However, this means I couldn't store anything over 4GB due to FAT32 limitations. I guess that 372 hour long continuous video I've been planning to record is not going to work out. Shucks. 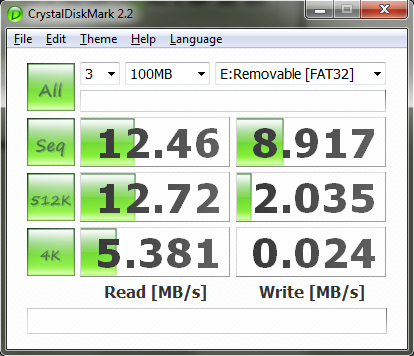 I benchmarked the performance in NTFS mode anyway and compared it to FAT32. There was almost no difference. 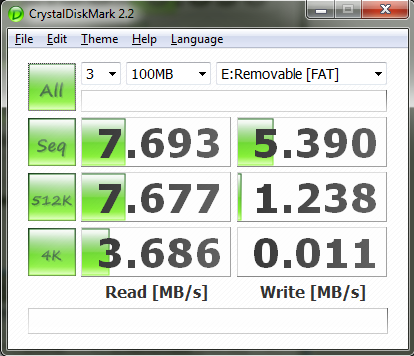 For my benchmark I used CrystalDiskMark - a small but capable freeware disk benchmark available here. The A-Data 16GB Class 6 MicroSD card is quite capable and fast - twice as fast as the minimum guaranteed spec in some cases. It is not the speediest in its class but also by far not the most expensive. If you are a looking for a high quality 16GB replacement for your phone, surely give this A-Data card a try.